During the numerous years of practice, IZI Ltd has gained a good reputation and became a trustworthy partner for all types of projects. In the framework of Erasmus+ mobility project “Peculiarities of Intercultural Dialogue” (2018-1-LT01-KA102-046705) 7 vocational training teachers from Lithuania had internship in Malta. Project was implemented together with Kaišiadorys School of Business and Technology. Internship lasted for 1 week in the middle of April, 2019. Teachers visited several Maltese vocational training schools, observed lectures and improved their qualification and abilities to work in classes, which consist of different nationalities students, as well as to fight against discrimination, sneering and ethnic conflicts. In the framework of Erasmus+ mobility project ‘From Idea to the Business (2017-1-LT01-KA102-034872) 8 vocational training small business services provider profession students had internship in Malta. Project was implemented together with Aukstadvaris Agricultural School from Lithuania. Internship took place in Malta in the February-March 2018, 20 days in total. Participants worked in various Maltese small business companies, where acquired new practical skills and specific professional competences. In the framework of Erasmus+ mobility project ‘Enjoy your meal!’ (2017-1-LT-KA102-034920) 8 vocational training cook – waiter profession students had internship in Malta. Project was implemented together with Kaisiadorys School of Business and Technology from Lithuania. Internship took place in Malta in the February-March 2018, 20 days in total. Participants worked in various Maltese restaurants, where acquired new practical skills and specific professional competences preparing meals containing fish or seafood and abilities to serve tables for fish or seafood dishes. In the framework of Erasmus+ mobility project “Innovations at the building site” (2017-1-LT01-KA102-034857) 8 vocational training builder – constructions finisher, interior decorator and electro-mechanic profession students had internship in Malta. Project was implemented together with Elektrenai vocational training centre from Lithuania. Internship lasted for 20 days in November, 2017. Participants worked in various Maltese building, interior and electricity companies, where acquired new practical skills and specific professional competences. In the framework of Erasmus+ mobility project ‘Diploma Supplement’ (2017-1-LT01-KA102-034837) a group of vocational training graduates have had an internship in Malta. Project was implemented together with Kaisiadorys School of Business and Technology from Lithuania. Internship took place in Malta from 16th of July until 4th of August, 2017. Its main goal was to provide graduates with the possibilities to acquire real work place experience and specific professional competences in order to increase their employment opportunities and competitiveness. During the internship vocational training graduates have also improved their English language skills, acquired entrepreneurship and cross-cultural understanding qualities, became more self-confident, tolerant and sociable. In the framework of Erasmus+ mobility project ‘Business Otherwise’ (2016-1-LT01-KA102-022763) 8 vocational training small business services provider profession students had internship in Malta. Project was implemented together with Aukstadvaris Agricultural School from Lithuania. Internship lasted for 3 weeks during the April 2017. Participants worked in various Maltese small business companies, where acquired new practical skills and specific professional competences. Acquired skills were acknowledged by ECVET. In the framework of Erasmus+ mobility project ‘Ideas for the menu (2016-1-LT01-KA102-022857) 7 vocational training cook – waiter profession students had internship in Malta. Project was implemented together with Kaisiadorys School of Business and Technology from Lithuania. Internship lasted for 3 weeks during the April 2017. Participants worked in various Maltese restaurants, where acquired new practical skills and specific professional competences preparing various fish and seafood dishes as well as serving them to the tables. Acquired skills were acknowledged by ECVET. In the framework of Erasmus+ mobility project ‘The Art of Constructions (2016-1-LT01-KA102-022773) 9 vocational training builder – constructions finisher, interior decorator and electro-mechanic profession students had internship in Malta. Project was implemented together with Elektrenai vocational training centre from Lithuania. Internship lasted for 3 weeks in the end of February – beginning of March, 2017. Participants worked in various Maltese building, interior and electricity companies, where acquired new practical skills and specific professional competences. Acquired skills were acknowledged by ECVET. In the framework of Erasmus+ mobility project ‘Career Path’ (2016-1-LT01-KA102-022753) a group of vocational training graduates (electro-mechanics and secretaries) have had an internship in Malta. Project was implemented together with Aukstadvaris Agricultural School from Lithuania. Internship lasted for 3 weeks, from 27th of June until 18th of July, 2016. Its main goal was to provide graduates with possibilities to increase their competitiveness by acquiring real work place experience and specific professional competences. During the internship vocational training graduates have also improved their English language skills, acquired entrepreneurship and cross-cultural understanding qualities, became more self-confident, tolerant and sociable. In the framework of Erasmus+ mobility project we received 2 groups of construction students. One from Tallinn and one from Lithuania, ‘The Mobility and the EU vocational training experience for quality improvement’ (2014-1-LT01-KA102-000324). Participants worked in various Maltese building, interior and building restoration companies, where acquired new practical skills and specific professional competences. Acquired skills were acknowledged by ECVET. We announce that project Mobile on the labour market - a vocational activation program for young people from the kujawsko-pomorskie region ” has started 15 march 2016. The lead partner of this Project is Polish Economic Society in Bydgoszcz. The Project runs in transnational cooperation with organizations from Germany (Sozialpsychiatrische Initiative Paderborn e. V.), Malta (IZI Ltd t / a Easy Job Bridge), The Czech Republic (Plastikářský Cluster) and Poland (Labour Office in Bydgoszcz; Bydgoszcz Industrial Cluster). The main goal of the Project is to increase economic, social and educational activity of people within the NEET group, by participating in transnational mobility. The recruitment process will involve gathering a group of 44 Participants, aged 18-35, from the NEET group and from kujawsko-pomorskie region. The expected results brought by the Project to the 44 participants are to increase their attractiveness on the labour market. Moreover, we hope they also improve professional experience and skills, motivation and awareness of the possibility to escape the threat of social exclusion. - acquisition of vocational, personal and social qualifications, which could help the Participants to integrate with the local labour market and use the skills and competences acquired as a result of participation in the Project. After returning from abroad the Participants will receive an offer of an apprenticeship, further education or job training and individual mentoring throughout the duration of the Project. Project Participants will attend internships in Maltese companies, chosen according to the Participants personal skills, professional competences and carrier expectations. The Project will be a unique opportunity for the participants to learn about different companies in Malta, culture of Malta and to gather professional experiences while working in Maltese companies. We hope that the whole process would be great experiences for Project Participants, organizations and companies involved. 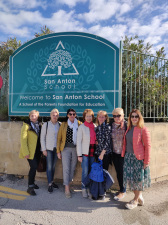 In the framework of Erasmus+ mobility project ‘Tolerant School’ (2015-1-LT01-KA102-013071) 5 vocational training teachers from Lithuania had internship in Malta. Project was implemented together with Aukstadvaris Agricultural School. Internship lasted for 1 week in the middle of April, 2016. Teachers visited several Maltese vocational training schools, observed lectures and gained practical knowledge about racism, xenophobia and discrimination issues’ solving experience in Malta. In Spring 2016 we were excited to host our first group from Berlin (project number: 2014-1-DE02-KA102-000669)! 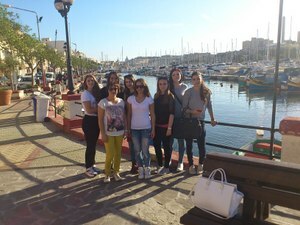 12 students arrived to Malta for their training in catering industry. The period of the training was from 8th April to 24th April 2016. In the framework of Erasmus+ KA1 mobility project ‘In the international vocational training with the BeKSZI’ 6 cooks, pastry chefs and waiters from Hungarian vocational centre did their work training in local Maltese restaurants and hotels, where they prepared local dishes, made pastries and sweets and serves the clients. The period of the training was from 7th April to 7th May 2016. 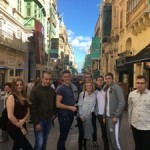 In the framework of Erasmus+ KA1 mobility project ‘Open your mind’ the group of 12 students from Slovenia came to Malta for a practical training in local Maltese companies and computer services. The period of training was from 20th March to 3rd April, 2016. The internship programme was dedicated to complete and strengthen the trainees’ skills. In the framework of Erasmus+ mobility project ‘European Menu’ (2015-1-LT01-KA102-013027) 8 vocational training cook – waiter profession students had internship in Malta. Project was implemented together with Kaisiadorys School of Business and Technology from Lithuania. Internship lasted for 3 weeks in the end of March – beginning of April, 2016. Participants worked in various Maltese restaurants, where acquired new practical skills and specific professional competences preparing various fish and seafood dishes. Acquired skills were acknowledged by ECVET. In the framework of Erasmus+ mobility project ‘Entrepreneurship and Experience in a Real Workplace’ (2015-1-LT01-KA102-013033) 8 vocational training small business services provider profession students had internship in Malta. Project was implemented together with Aukstadvaris Agricultural School from Lithuania. Internship lasted for 3 weeks in the end of March – beginning of April, 2016. Participants worked in various Maltese small business companies, where acquired new practical skills and specific professional competences. Acquired skills were acknowledged by ECVET. In the framework of Erasmus+ mobility project ‘Constructional solutions’ (2015-1-LT01-KA102-013010) 9 vocational training builder – constructions finisher, interior decorator and electro-mechanic profession students had internship in Malta. Project was implemented together with Elektrenai vocational training centre from Lithuania. Internship lasted for 3 weeks in the end of February – beginning of March, 2016. Participants worked in various Maltese building, interior and electricity companies, where acquired new practical skills and specific professional competences. Acquired skills were acknowledged by ECVET. In the framework of Erasmus project 6 vocational training cook – waiter profession students had internship in Malta in 3, 4 and 5 stars Hotels. Acquired skills were acknowledged by ECVET. 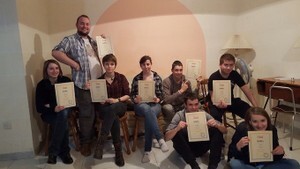 All students got certificates at the end of their mobility. The second group of French student’s (in 2016) came on 10th January for 4 weeks to explore Maltese graphic industry – to learn more about digital and offset printing. They reached project’s targets successfully and left Malta at the end of the mobility on 4th Of February. We were glad to host a group of shop assistant students from France, who had their internships at cloths’, electronics’ and music instruments’ shops in Malta. 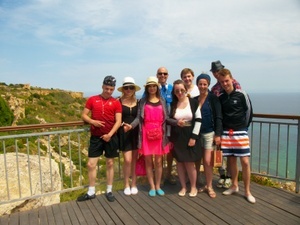 The students left Malta with great memories and improved professional and language skills. The dates of their mobility were between 9th January to 5th February 2016. The number of the project: 2014-1-FR01-KA102-001671. In the framework of Erasmus+ KA1 mobility project ‘Gradimo temelje prihodnosti’ (No. KA1-VET-12/15) the group of 12 pre-school education students enjoyed their work experience in local kindergardens between from 25th October to 14th November, 2015. Students enjoyed learning new teaching methods and doing fun activities with the little ones. This Autumn (2015) we had a pleasure to host a number of teachers from Czech Republic for a job shadowing in our local primary and secondary schools. 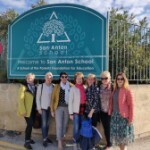 Teachers delivered lessons, exchanged their knowledge and experiences with Maltese colleagues. We were happy to serve as a bridge between these educational institutions. On 11-31st October, 2015, we hosted Erasmus+ project ‘Job Route – journey to job’ (project code KA1-VET-6/2015) from Slovenia. 4 students had training in administration and accounts and 2 carpenters learned about wood processing, furniture making and assembling. In the framework of Erasmus+ KA1 project ‘Enlarging vocational skills abroad’ () 6 car mechanics students from Hungary came to Malta for the practical training in car servicing. They did not only developed their professional skills but also had time to explore the island, meet local people and made new friends. The period of training was from 4th October to 1st November, 2015. In the framework of Erasmus+ KA1 mobility project ‘Stopimo Skupaj (Come together)’ the group of 11 students from Slovenia came to Malta for a practical training in local Maltese companies. The period of training was from 27th September to 10th October, 2015. The internship programme was dedicated to strengthen the trainees’ logistics and administration skills. In the framework of Erasmus+ KA1 mobility project ‘Paloc Youngsters facing new challenges, 2015’ (No. 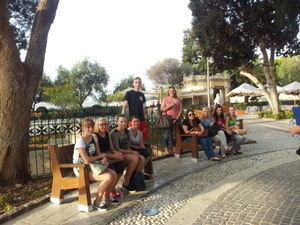 2015-1-HU01-KA102-013194) the group of 16 students attended English language courses and had a practical training in local Maltese companies. The project was implemented with a vocational school from Hungary. The period of training was from 29th July to 26th August, 2015. The internship programme was dedicated to complete and strengthen the trainees’ English and enhance the trainees’ skills related to specific work contexts, as a secretary of finance and accountancy, chef or shop assistant. In the framework of Erasmus+ mobility project ‘Second Diploma’ (2015-1-LT01-KA102-013040) a group of vocational training graduates (cooks – waiters, electro-mechanics and secretaries) have had an internship in Malta. Project was implemented together with Elektrenai Vocational Training Centre from Lithuania. Internship lasted for 3 weeks, from 6th until 27th of July, 2015. Its main goal was to provide graduates with possibilities to acquire real work place practice and deficient practical professional skills and competences as well as achieve better employment opportunities, educate entrepreneurship, initiative, cultural understanding and self-confidence. 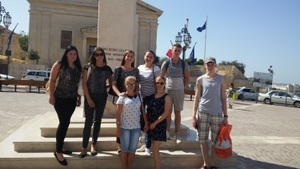 In the framework of KA1 mobility project ‘Europeans trainees: for Europe into good hands’ (2014-1-FR01-KA102-000167) 8 hospitality students from France came for their practical training in Malta. The students were located in North part of Malta. They worked in local well known hotel, different departments, and stayed in host families, within the walking distance from the hotel. 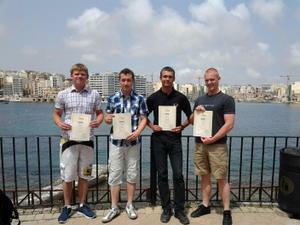 Trainees stayed in Malta between 24th May and 13th June. All the trainees have acquired more confidence and improved their language skills. Moreover, being surrounded by an international environment they have learned how to deal with their colleagues and they have been able to develop a better attitude to problem solving. In addition to this, they could observe how important is to learn foreign languages along with practical skills, especially in the hospitality industry. In the framework of KA1 mobility project ‘Secrets of the kitchen. Cooks’ – waiters’ internship abroad’ (2014-1-LT01-KA102-000040) 10 cook – waiter profession vocational training students have had internship in Malta. Project was implemented together with Kaisiadorys School of Business and Technology from Lithuania. Internship lasted for 3 weeks, from 4th to 25th of May, 2015. Participants worked in various Maltese restaurants, where they acquired knowledge and practical skills in preparation of meals, which contain fish or seafood as well as in decoration and preparation of tables for fish or seafood dishes. Participants also improved their abilities to serve customers in foreign language. Acquired skills were acknowledged by ECVET. On 27th April-4th May, 2015, we hosted 5 teachers-professionals from Agricultural School (Lithuania) for staff mobility and training (Project Number Nr. 2014-1-LT01-KA102-000094) in Maltese aquaculture. 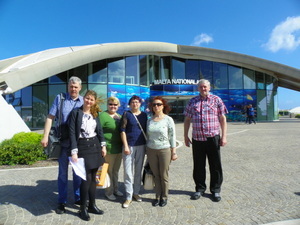 The participants had visits and meetings at Malta National aquarium, San Lucjan Tower – Aquaculture centre in Malta, participated in discussions about fish breeding, cultivation and processing, observed freshwater and saltwater recirculation systems and their operation, familiarised with local aquaculture and fisheries training programs. 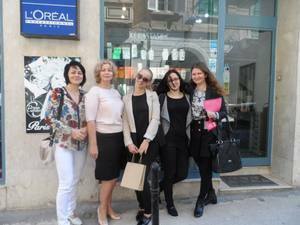 In the framework of Erasmus+ KA1 mobility project ‘Professional Qualification Development in a practical contest’ we hosted 2 teachers and 4 students (2 hairdressers and 2 beauticians) for the training in the field of their study between between 20th April to 11th May. The hairdressers assisted with cutting, trimming and shaping hair or hairpieces, based on customers’ instructions, hair type and facial features, using clippers, scissors, trimmers and razors, schedule client appointments, helped with bleaching, dyeing, or tinting hair, using applicator or brush. Beautician trainees helped with carrying out procedures such as body wraps, and exfoliation, maintaining of eyelashes, lightening skin pigments, help to perform facials did make up for the clients. In the framework of Erasmus+ KA1 mobility project 4 students studying construction finishing and restoration did their training in Malta for 6 weeks between 14th April to 26th May. Their work included restoration of historical walls and fortresses together with external surfaces of the buildings, repairing the plaster,laying the surface of the covering and much more. Students were provided with safety equipment and worked under professional’s supervision. On 13th April- 11th May, 2015, we hosted 5 jewellery and 4 interior décor students (Project No. 2014-1-LT01-KA102-000287). Interior décor students had a great opportunity to work with Sketch Up and AutoCAD programs and learn from professionals themselves. They made 3D images, designed furniture (drew sketches), chose materials, combined the colors and much more. Jewellery students were taught filigree method, twisting spins with tweezers and preparation of the frames for pendants. They also used silver cleaning machine and learnt how to coat the metal using electrolysis. They also communicated with customers and sold already made jewellery for the tourists. In the framework of Erasmus+ KA1 mobility project ‘Pursuit of European qualifications in specialists of information technology and visual communications’ (project number LLP-LdV-IVT-2013-LT-0856) 3 computer operators and design students came to Malta for three-week internships in Malta to deepen their practical professional skills and seek out for new competencies that would enhance their competencies, improve their foreign language skills. 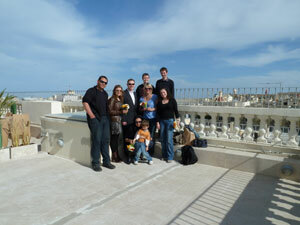 The training in Malta took place from 6h April to 27th April. On 6-13th April, 2015, we hosted 3 teachers from Applied Arts vocational training institution for staff mobility and training (No. 2014-1-LT01-KA102-000287) in Maltese filigree art. 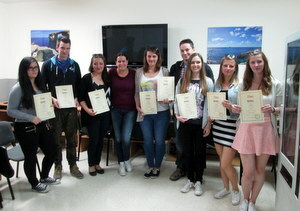 The teachers had a course delivered by one of the best jewellery makers in Malta. Also they had an opportunity to visit a Crafts village in Ta’Qali, see the jewellery making processes and discuss Malta’s design peculiarities, trends and technical methods of working with 925 Sterling Silver. The Maltese filigree teacher created an excellent environment and creative atmosphere to develop participants’ skills. The projects’ results exceeded participants’ expectations. On 7-24th April, 2015, we hosted Erasmus+ project ‘International practice – successful integration into the labor market’ (project number 2014-1-LT01-KA102-000140) from Lithuania. Four trainees participated in events’ planning and worked as animators in famous amusement park ‘Popeye Village’. 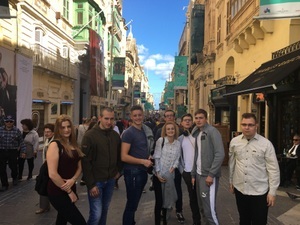 In the framework of Erasmus+ KA1 mobility project ‘Open your mind’ (KA1-VET-084/2014) the group of 10 students from Slovenia came to Malta for a practical training in local Maltese companies. The period of training was from 29th March to 11th April, 2015. The internship programme was dedicated to complete and strengthen the trainees’ English and enhance the trainees’ skills related to specific work contexts, as a secretary of finance and accountancy, chef or shop assistant. We were happy to host 8 teachers from Vocational school, Romania, for 8 days staff training (project’s number 2014-1-RO01-KA102-000995). Among many activities and enterprenership course we organized for then, they had study visits to local business incubation centers, Centre for Entrepreneurship, Meeting with Business First, where they discussed the motivation of the students to become a young entrepreneurs. The teachers the mentors for their students’ virtual enterprises and came back home with many new ideas for future school’s projects. In March 2015 Easy Job Bridge was also responsible for the mobility implementation (project number 2014-1-ES01-KA102-000807) for 3 engineering students from Spain. Field of vocational education: Technician in Electrical and Automatic Installations. Trainees were doing low voltage electrical installations applying current legislation, safety and quality regulations of the local Maltese host company company. Also they participated in the operations and stages of commissioning and service of installations and equipment following the established procedures, learned he diagnosis and repair of breakdowns and malfunctions in installations and equipment, applying corrective maintenance techniques and procedures. Their training lasted from 22nd March to 13th June, 2015. In March 2015 Easy Job Bridge organized a study visit for a teacher from Rokiskis Technology, Business and Agricultural School (Lithuania, project number 2014-1-LT01-KA102-000005). Mr Saulius Limontas undertook a job shadowing in Maria Regina College, Career guidance department, between 17th and 20th March, 2015. He shared expierence and knowledge with Maltese teachers about the career guidance in local schools, Interacted with Maltese students, learned about career advisory services: post-secondary course options, CV building, interview and job searching skills. In the framework of Erasmus+ mobility project ‘Business principles’ (2014-1-LT01-KA102-000014) 8 vocational training vehicles’ maintenance and monitoring business employee profession students have had internship in Malta. Project was implemented together Aukstadvaris Agricultural School from Lithuania. Internship lasted for 3 weeks, form 8th to 30th of March, 2015. Participants worked in various Maltese vehicles’ maintenance companies. Students acquired specific professional skills to maintain chassis, transmissions, engines and body of city type cars, they got knowledge about ways of gas emission reduction, improved their abilities to do vehicles’ electronics diagnostics. Acquired skills were acknowledged by ECVET. IZI Limited in collaboration with Ability+ organized the course “Supporting Families within Social Risk Groups”. The course took place between 16th and 20th November 2014 and was attended by members of Latvian municipality, who came to Malta under Erasmus+ project to extend their knowledge in conflict solving and working with parents using different kind of methods. The following topics were also discussed: The Diverse Family & Related Challenge, Creating Partnerships – Children, families & Schools, Emotional and Behavioural Difficulties, Cognitive, Behavioural & Systemic Approaches to Coping with Emotional and Behavioural Difficulties, Supporting Parents Support Children. 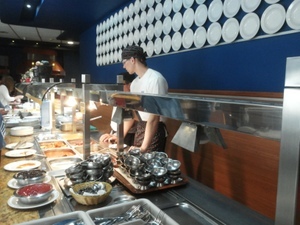 The participants took part in practical activities and use this experience use in their everyday work. In the framework of Erasmus+ KA1 mobility project ‘Open your mind’ (KA1-VET-084/2014) the group of 10 students from Slovenia came to Malta for a practical training in local Maltese companies. The period of training was from 9th to 23rd November, 2014. The internship programme was dedicated to complete and strengthen the trainees’ English and enhance the trainees’ skills related to specific work contexts, as a secretary of finance and accountancy, chef or shop assistant. In the framework of Erasmus+ mobility project ‘Building sector today: master and apply’ (2014-1-LT01-KA102-000154) 8 vocational training builder – constructions finisher and electro-mechanic profession students have had internship in Malta. Project was implemented together with Elektrenai vocational training centre from Lithuania. Internship lasted for 3 weeks, from 3rd to 25st of November, 2014. 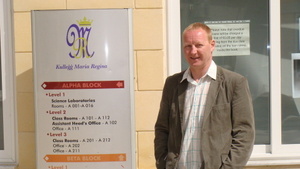 Participants worked in various Maltese building and electricity companies. Electro-mechanics acquired knowledge and practical skills how to install and maintain electricity system’s protection against surge and fluctuation of voltage, how to install electricity installation in areas of high humidity. Builders – constructions finishers gain practical knowledge know to use ceramic, stone-made and marble-made bricks in the decoration of interior and exterior, acquired skills of natural stone usage in the building works. Acquired skills were acknowledged by ECVET. In the framework of Erasmus+ KA1 mobility project ‘‘Catering knowledge import’ – vocational practice of chef and waiter trainees in Europe’ (2014-1-HU01-KA102-000261) 2 cook-waiter students from Hungary did their internship in local Maltese restaurants, where they worked hand in hand with the professional chefs. The period of training was from 15th October to 15th November, 2014. IZI Limited in collaboration with Ability+ organized the course “Preparing Students with Social Communication difficulties for the workplace”. The course was part of Erasmus+ project titled “Inter-cultural comparative analysis of social skills training experience for socially excluded children”, project number: 2014-1-LT01-KA101-000292, coordinator: School of Applied Arts in Kaunas, Lithuania. This project was designed to strengthen The Child Welfare Commission as a team by gaining more practical knowledge. The course provided the participants with tools which may be used in an educational setting to help students enhance their communication skills, to manage stress, to keep relationships which ultimately are the skills required for students to secure employment. The participants were provided with a large number of resources, hand-outs and video clips which will enable them to select and adapt according to the needs of their students. The course lasted for 5 days, from 20th to 24th October, 2014. In the framework of Erasmus+ KA1 project ‘Mobility project for car mechanics in Valletta’ (2014-1-HU01-KA102-000090) 6 car mechanics students from Hungary came to Malta for the practical training in car servicing. The experience exceeded their expectations and they came back home with more skills and bigger knowledge of the area of their studies. The period of training was from 19th October to 8th November, 2014. In the framework of KA1 mobility project ‘Secrets of the kitchen. Cooks’ – waiters’ internship abroad’ (2014-1-LT01-KA102-000040) 10 cook – waiter profession vocational training students have had internship in Malta. Project was implemented together with Kaisiadorys School of Business and Technology from Lithuania. Internship lasted for 3 weeks, from 9st to 31st of October, 2014. Participants worked in various Maltese restaurants, where they familiarized with Mediterranean cuisine, seafood preparation, table decoration methods and appropriate customers serving. In the framework of Erasmus+ KA1 mobility project ‘BéKSZI in Europe’ (2014-1-HU01-KA102-000349) 4 students studying construction and car mechanics arrived from Hungary to Malta to gain work experience. The construction students worked in one of the building sites in central Malta and car mechanic assisted in the garage with repairing different parts of the vehicle, changing the oils, light bulbs, tyres, ect. The period of training was from 23rd September to 21st October, 2014. In the framework of Erasmus+ Leonardo da Vinci mobility project ‘Business principles’ (2014-1-LT01-KA102-000014) 10 vocational training small business provider profession students have had internship in Malta. Project was implemented together with Aukstadvaris Agricultural School from Lithuania. Internship lasted for 3 weeks, form August 28th to September 18th, 2014. Participants worked in various Maltese companies where they acquired abilities how to coordinate different activities in company and gain knowledge about development of small business for tourists and recreation. 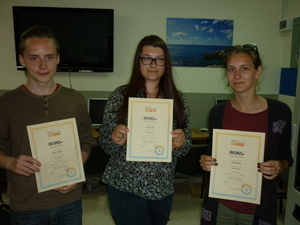 In the framework of Erasmus+ KA1 mobility project ‘Acquiring new information technologies in Europe’ (2014-1-HU01-KA102-000163) a group of 6 students from Hungary had a practical training in local IT companies in Malta. The period of training was from 16th August to 30th August, 2014. The internship programme was dedicated to improve website and software development skills. The group enjoyed many cultural activities and were fascinated by beauty of the islands. In the framework of Erasmus+ KA1 mobility project ‘Learn the Trade-Workplace is a good school, 2014’ (2014-1-HU01-KA102-000232) the group of 16 students attended English language courses and had a practical training in local Maltese companies. The project was implemented with a vocational school from Hungary. The period of training was from 11th August to 29th August, 2014. The internship programme was dedicated to complete and strengthen the trainees’ English and enhance the trainees’ skills related to specific work contexts, as a secretary of finance and accountancy, chef or shop assistant. 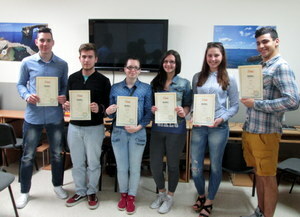 In the framework of Erasmus+ Leonardo da Vinci mobility project ‘Graduates’ internship abroad. Career start II’ (2014-1-LT01-KA102-000004) a group of vocational training graduates (cooks – waiters, electro-mechanics, builders and accountants) have had an internship in Malta. Project was implemented together with Kaisiadorys School of Business and Technology from Lithuania. Internship lasted for 3 weeks, from 20thof July until 10thof August, 2014. In the framework of Leonardo da Vinci mobility project ‘Discover, master, apply. Cooks’ – waiters’ practice abroad’ (LLP-LdV-IVT-2013-LT-0811) 8 cook – waiter profession vocational training students have had internship in Malta. 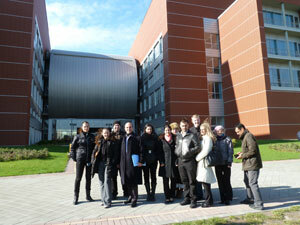 Project was implemented together with Kaisiadorys School of Business and Technology from Lithuania. Internship lasted for 3 weeks, from 1st to 20th of April, 2014. Participants worked in various Maltese restaurants, where they familiarized with Mediterranean cuisine, seafood preparation, table decoration methods and appropriate customers serving. In the framework of Leonardo da Vinci mobility project ‘Construction – innovations and prospects’ (LLP-LdV-IVT-2013-LT-0857) 8 vocational training builder and constructions finisher profession students have had internship in Malta. Project was implemented together with Elektrenai vocational training centre from Lithuania. Internship lasted for 3 weeks, from 10th to 31st of October, 2013. Participants worked in various Maltese building companies where they familiarized with usage of natural stone in masonry and decoration, further covering of stone-walls, hydro-isolation methods, ceramic and stone bricks tiling with ground preparation. Group of social workers and nurses from Zemaitija Mental Health Center came to Malta for a numerous meetings to discuss socially disadvantaged groups (people with disabilities, dysfunctional families, long term unemployed people) integration into a labor market in Malta. The aim of the project was to familiarize with Malta government’s policy towards integration of groups in question, to gain the experience in organizing courses for people with disabilities and prepare the proposals how to improve the support for disadvantaged groups in their country. We were in charge of organizing all the meetings, accommodation, transfers and cultural activities. In the framework of Leonardo da Vinci mobility project ‘Small business – experiences and innovations’ (LLP-LdV-IVT-2013-LT-0804) 8 vocational training small business services provider profession students have had internship in Malta. Internships lasted for 3 weeks, from 25th of August until 15th of September, 2013. 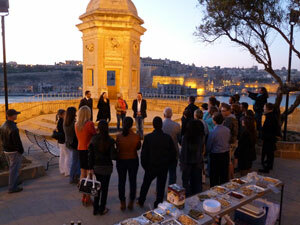 Participants worked in various Maltese small business companies (libraries, kindergartens, hotels) where they familiarized with various forms of small business organization as well as planning of their activities, analyzed companies’ work and improved IT usage skills as well as English language. We are a partner in the project with Germany “Work Experience Malta/Mallorca (WEMA)” which is funded by the European Social Fund and the German employment agency. The project is targeting the disadvantaged unemployed segment of the population. The participants for the internship are carefully selected and undertake a six week job preparation phase including an English course in Germany before coming to Malta. 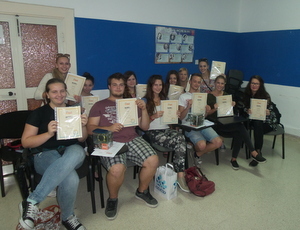 Upon their arrival in Malta they attend a further two week English course at our school before they start their work placements which last six weeks. We are entrusted with the project management of the Maltese side of the project and its role includes the sourcing of the right work placements for the participants, attending weekly reflection meetings, organising interviews and 2 weeks of English and cultural training in order to prepare the participants for their time in Malta. The idea behind the project is to diversify the participant’s experience and mobilise them to another country in order to make them more employable reduce the unemployment rate in Europe. The project has yielded excellent results. In 2012, IZI Ltd was awarded the grant to be part of a Grundtvig Learning Partnership for a project entitled “Development of Audit guidelines for Training and Education”, the acronym for which is “DANTE”. The aim of this project is to introduce adult students to comprehensive audit guidelines for assessing the environmental performance of education institutions (and beyond), thereby also training them to identify problem areas where intervention may result in considerable, yet resource-efficient improvements. One of the goals is to encourage participating professionals and institutions to incorporate sustainability better into their curriculum and to make use of traditional as well as state of the art technologies in adult education, such as informal training methods and mobile training, e-learning, podcasts and video solutions. Together with the St Thomas More College in Malta and our partners in Romania, IZI Ltd has applied for and been awarded the project entitled “Non-formal and informal Education through ICT”. The project aims to develop skills and abilities of the educational actors in the partnership to use methods and learning strategies of non-formal and informal methods associated with ICT in an intercultural context. The project also offers the opportunity to work with other teachers in the partner country to identify the best methods and techniques used for non-formal and informal learning associated with ICT and to foster intercultural exchanges and strengthening collaboration with educational stakeholders in the partner country. IZI Ltd is the transnational partner of a German employment project called “Job Bridge Malta” which is funded by the European Social Fund and the German employment agency. The project is being done in collaboration with a language institute as well as an educational institution in Leipzig, Germany. The participants for the internship are carefully selected and undertake a six week job preparation phase including an English course in Germany before coming to Malta. Upon their arrival in Malta they will attend a further two week English course at our school before they start their work placements which last six weeks.